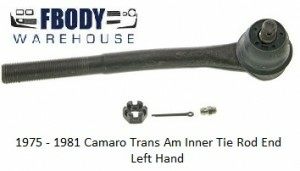 This is a new replacement inner tie rod end for 1975 - 1981 Camaro and Trans Am models. This is the LH side. Worldwide shipping also available use the drop down menu below to select shipping location. 1977 - 1981 Trans Am Red Nose Crest Emblem NEW With INSTALL VIDEO!